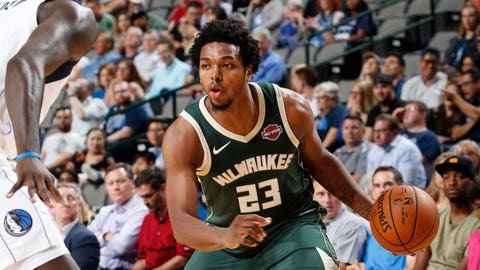 MILWAUKEE — Milwaukee Police Chief Alfonso Morales apologized to Bucks guard Sterling Brown on Wednesday for a January arrest that started with a parking violation and escalated to include the use of a stun gun, and he said some officers were disciplined. Morales’ apology came as police released body-camera footage that showed how a simple interaction over an illegally parked car quickly escalated. The video represents another setback for a department that for years has tried to rebuild its image and relationship with Milwaukee’s black residents after several high-profile cases of police misconduct. Police did not identify the races of the officers, but most of the officers in the video appeared to be white. It began around 2 a.m. on Jan. 26 in a Walgreens parking lot. As Brown walks out of the store, an officer standing by Brown’s car asks him for his driver’s license. When Brown gets close to his car’s passenger door, the officer touches Brown and he tells the officer not to touch him. “Back up! Back up!” the officer yells. “For what? I ain’t did nothing,” Brown responds. Brown eventually does show the officer his driver’s license. “I got up on your face? Really?” Brown responds in disbelief. Brown is heard groaning in pain on the ground, although he’s barely visible from the camera’s viewpoint. “The department conducted an investigation into the incident, which revealed members acted inappropriately and those members were recently disciplined,” Morales said at a brief news conference. “I am sorry this incident escalated to this level,” he added. He left without taking questions. He did not identify the officers or say how they were disciplined. The Milwaukee Bucks signed the 6-foot-6 guard from Southern Methodist University in Texas last summer in a deal with the Philadelphia 76ers. Later in the video, after officers used the stun gun, Brown can be heard having a conversation with someone away from the view of the camera. “They tased me for no reason,” an agitated Brown says. “And now he’s like, `I’m a Bucks player, blah, blah, blah. So what,” the officer says. City officials’ concern over the content of the video was apparent earlier this week when Mayor Tom Barrett said he found it concerning. Fred Royal, the president of the NAACP in Milwaukee, said Wednesday that he “didn’t see anything that would warrant” a stun gun being used on Brown. “I find it disturbing that an officer would incite an argument over a parking citation,” Royal said. A day before releasing the body-camera footage, Morales posted a video on YouTube to reiterate his commitment to rebuild the public’s trust in the department. Morales was appointed chief in February, following the retirement of Edward Flynn, who held the position for 10 years. Last year, Milwaukee paid $2.3 million to settle a lawsuit over the death of Dontre Hamilton, a mentally ill black man fatally shot by a police officer after the officer roused him from a park bench downtown. The officer said he shot Hamilton 14 times in self-defense because they got into a struggle when the officer frisked him for weapons. In 2016, the city paid $5 million to settle a lawsuit by 74 black residents who said police illegally strip-searched them between 2008 and 2012. Currently, the city is considering settling a lawsuit by the American Civil Liberties Union in Wisconsin, which is representing eight residents who say police targeted them for stops because they were African-American or Latino and because of the high-crime areas where they lived. In early May, police and prosecutors began investigating four officers who were involved in the violent arrest of a black man in a majority African-American neighborhood. Video from a bystander showed a group of officers kicking and punching the man on the ground while he was restrained. Police presented their body-camera footage of the encounter, which showed the man aggressively charging at officers and trying to punch them.